Dropcam is the trendsetter in intelligent wi-fi cameras and personal video streaming services. Users access their Dropcam camera on a PC and smart phone, stay up to date with email and push motion detection alerts and can DVR up to 30 days of moment-by-moment video. Video feeds from a Dropcam camera can be safely and privately shared with friends and family. Dropcam is the easiest way to use video to check in on the things you care about from anywhere, any time, on any device. When we were offered to review the Dropcam I was excited to try it. We have a video baby monitor in Ethan’s room, but nothing in Emma’s. Video monitors are nice, but you can only view what is happening right that minute and we were pretty sure she was getting up in the middle of the night. She had recently been extra crabby and tired and we kept wondering what was going on in her room while we weren’t watching. 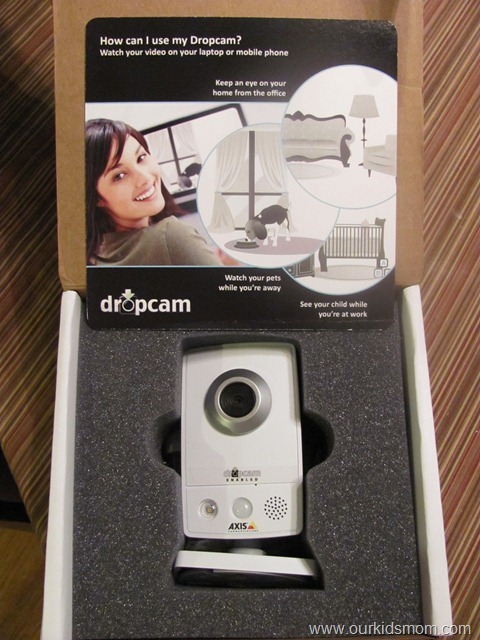 The Dropcam arrived safely in a very nicely padded box. After unpacking it we headed to the computer to set it up. The website totes a 2 minute install. Could it really be that easy? It actually was! It’s a matter of plugging it into your router, doing a little computer setup and you are ready to go. The Dropcam works over your Wi-Fi signal, so the only plug you have is the power adapter. The Dropcam does not accept batteries… and this was intentional. Batteries die quickly and it is easy to forget to change them. By having the Dropcam plugged in you’ll never have to worry about losing your video due to batteries dying out. The Dropcam comes with free live video monitoring. Just log into your account you created while setting up the camera and you can view live streaming video (and audio if you have the Echo model). If you are on the go, they offer smart phone viewing as well. Don’t have time to sit and watch the video 24/7? They also offer a DVR storage plan that basically stores EVERYTHING in the “cloud”. It doesn’t take up any space on your computer and all of your video is secure online and can be accessed from anywhere. Never worry about losing your video that is stored on your computer. Crashes and theft happen! You can also set up email and push motion alerts to notify you if something is happening. The DVR will save up to 30 days of moment to moment video and tag any motion detected on the time line with big yellow dots. This was super helpful for us, because as I mentioned above… we wanted to see what was going on when Emma was supposed to be sleeping. So it happened. Emma woke up extremely crabby one morning even though we thought she had slept about 11 hours. I sat down and logged into the system and scrolled through the DVR looking for yellow dots. Nothing… until around 2am, then I found it. You will see in the video what she was doing, but I wanted to tell you quickly how I got the video clip. You can choose a time frame and request a video clip sent to your email. Within minutes it processes and is available for your use! Not only do you have it on your computer, but it is still available for viewing online through your account. So… why was Emma so crabby that day? Nice huh? We caught her watching television at 2 am. N.I.C.E. Emma. At 35 seconds in you will see her getting up and readjusting her sheets. So we had a talk, and I showed her this clip. She now knows that we are watching and if she wants to keep her television… it stays off until the sun is up. So what about naptime? She wasn’t sleeping at night, so she had to be exhausted during the day and sleep, right? Well… this particular day we were having our roof replaced (hence, the banging noises in the video) so it made it harder to focus on sleep… but take a look at 1 minute in. Notice right before that time she looks at the camera to “see” if we are watching. So our “testing” time is over… what do we have planned for our Dropcam now? Currently, it is still in Emma’s room… because I like that she knows we are watching. The Dropcam is easy enough to move. We have plans to have it in the living area on occasion when we leave to see how exactly Emma and Ethan are behaving for their older brother (we have had some bad reports). Absolutely. It’s versatile, easy to move, has great picture quality during the day, picks up sound nicely and it’s super easy to use. The peace of mind it worth the price! What are some other great uses? 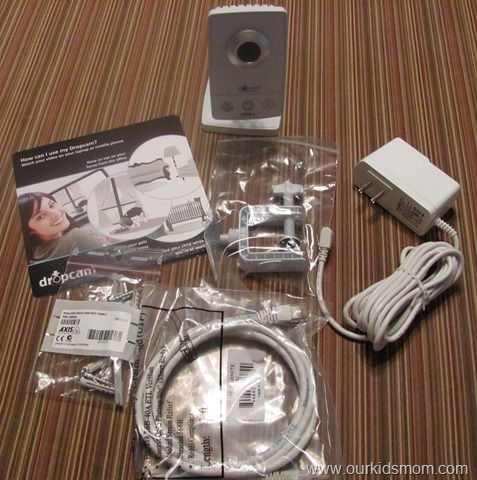 ONE OurKidsMom reader is going to win an Echo Dropcam RV $279! * Check out Dropcam’s website and tell me something you like, learned or want. This giveaway ends at 11:59PM EST on June 24, 2011. Your video is encrypted using bank-level security. It’s stored on remote servers on guarded premises. Dropcam video is your video – you control who sees it. I learned I could get video on my iPhone! I just joined the cool kids and got a smart phone so I LOVE that you can get video sent to your Android! i love that this is mobile and wi-fi ready! i would use this to watch what my pets do when im gone! MANDATORY ENTRY: I learned you can even check in and watch the camera while you’re on vacation! That is AWESOME! I like DropCam on Facebook. I’m facebook.com/heartsncrafts so you can verify. 1. I subscribe to OurKidsMom via e-mail. lindsaydelores at gmail. 2. I subscribe to Our Kids Mom via e-mail. lindsaydelores at gmail. 1. Added you to my blog roll (right hand corner, favorite blogs) – http://www.youaretheroots.com. 2. Added you to my blog roll (right hand corner, favorite blogs) – http://www.youaretheroots.com. I love that it can be accessed with a cell phone! I also entered your Baby Sense Sleepy Sac giveaway. I also entered your Stella and Dot giveaway. I also entered your Summer Infant Video Monitor giveaway. I likeDropCam on FB as Anne Loyd. Visited the site and I learned that the Dropcam has and easy two-minute setup as it instantly connects to the web. You can watch on your favorite device from anywhere. No computer or DVR box needed. Also learned about the service plans available. I like the made for mobile feature. I like how high quality the video looks! And the lowbandwidth! I love the streaming video option. I learned that the dropcam can be left opened all day! I like how the videos are stored with bank encryption- no one can see your videos except you! I love that the Dropcam’s DVR highlights motion and audio events so you can quickly find what you missed. That’s a great feature. I learned Dropcams come in two models: Dropcam Original and Dropcam Echo for those who want audio capabilities as well. Both come with instant online access, easy setup, and all the other great features. I love the two minute setup the site boasts about! I am not computer saavy, so this is great! I learned that they have an iPhone And Android app which it makes it perfect for individuals that don’t have them computer on them at times! Entered for the drop cam, subscribe by e-mail and buzzed about it on google! I learned that the video is encrypted with bank level security. I learned that the Dropcam sends live and recorded full-motion video to your iPhone or Android device so you can watch while you live your life. I learned and like the fact that I can see it on my Android phone, easy to watch what goes on while on the go. I like the easy set-up and the fact that you can get audio also and that you can watch using your iphone. Google Friend is not showing up on my sidebar for some reason. I may already be a follower. I like Our Kids Mom on fb. I like Dropcam on fb. I entered your Little Tikes Riding Truck giveaway. I like the easy 2 minute set up. I learned the video is stored on remote servers on guarded premises. MANDATORY ENTRY: Oh My Gosh…this product is totally awesome! I really like the feature where one can see what’s going on at one’s house. Now that’s sneaky stuff. I wonder if my husband already has one of these camera’s installed here at our home and he’s spying on me while I’m home during the day? Hhhmm? Makes me wonder? Anyway, I really like the ‘spying’ feature this camera has, totally cool. I wish this camera was around when I was younger and I was a “latch-key” kid, you know? Gosh, technology sure has come a long way, huh? Dropcam sets up in a flash. No technical skill required – just plug it in and it simply works. I like the fact that it is so flexible in where and to which electronic medium it can be used. Entered the Summer Infant giveaway. What I want from Dropcam is the ability to check in on my mom. I have to go back to work and I am honestly worried because I have been helping take care of my mother who is in treatment for cancer. I am worried because she has a difficult time walking and is very stubborn and independent. My work is 15 minutes away and if I could check in on her and either call for help quickly or run over there in an emergency I would feel a thousand times better in my heart. I like that Dropcam has an easy set-up and I like the alerts. Entered the Little Tikes Cozy Truck Giveaway! I love the electronic notifications this sends when it detects motion!! this unit send feed directly to your iphone! unbelievable! Dropcams are instantly viewable using your favorite internet browser on both Mac or PC. I like the easy set up the best, being tech challenged. I like that it can sends live and recorded full-motion video to your iPhone or Android device so you can watch while you are not around, and I went on the FAQ and found that you CAN transfer your account to someone else, just needs to be verified. In our family we do lend out baby items and this would be one really cool thing to have with a newborn soon! entered your Brezza baby food maker! ENtered your Summer Secure monitor giveaway! follow you both and tweeted! I LOVE how clear it is! amazing! I like that it says it only takes 2 minutes to set up. This would make me think even a ditz like me could set this up: Easy two-minute setup Plug in a Dropcam – it instantly connects to the web. You can watch on your favorite device from anywhere. No computer or DVR box needed. Dropcam will send a message to your phone when it detects motion. I like that it has motion alerts. I like how their is an iphone app with push notifications available–super cool! I learned that Dropcam video is bank security level encrypted. Thats awesome you can watch it on your android! My favorite features are the 2 min set up and the yellow dots you mentioned that notify when motion is detected. That would be very useful when using it as a surveillance camera. I would love to set it up in my backyard to catch our neighbors dog in the “act”.. sigh.. anyways. thanks for this giveaway! I learned that the video is encrypted using bank-level security. It’s stored on remote servers on guarded premises. Dropcam video is your video – you control who sees it. I entered The Bar Method Pregnancy Workout DVD ends 6/16 giveaway. I entered the Kneebouncers Keyboard Banger Games ends 6/16 giveaway. I entered the Scotch Magic Greener Tape eco-friendly Desk Set ends 6/15 giveaway. I entered the ZAP Sweet Treats 1/2 lb Fudge ends 6/15 giveaway. 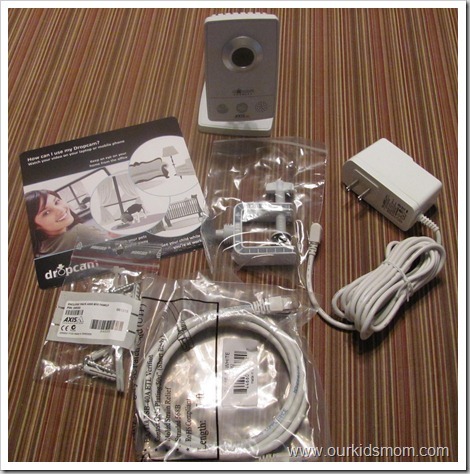 I entered the Summer Slim & Secure Handheld Color Video Baby Monitor ends 6/14 giveaway. I entered the 3 Preschool DVDs (Barney/HIT Favs/Trains) ends 6/14 giveaway. entered Bath & Body Works Pocket Bac ends 6/9 giveaway . I love it that you can watch it from your phone! Wow I need one of these! I like Dropcam on facebook. Entered Disney Lemonade Mouth giveaway. Entered Baby Sense Sleepy Sac giveaway. Entered Thomas & Friends Birthday Express DVD giveaway. Entered Nickelodeon’s Fanboy DVD giveaway. Entered Bath & Body Works PocketBac giveaway. Entered Barbar Curling Iron giveaway. I really like their emphasis on safety…and their products all look to be of very high quality. I love how quick and easy the setup is! entered Spongebob Square Pants Heroes of Bikini Bottom GIVEAWAY! ugh… slow internet connection. Sorry… please delete this comment. I’m entered in the Microsoft Office Giveaway. I love that it will work with Android systems, yay! Poor Emma, she’s so busted! I like the online recording and phone alerts, this will assure me when I am gone everything is safe. I really liked the fact that there is Android support. Did not realize that this camera was able to work without extra computer; also that this kind of monitoring device existed. How safe this could make your life if you were gone or wanted to monitor your children and a sitter (nanny) while you were away. Very interesting! 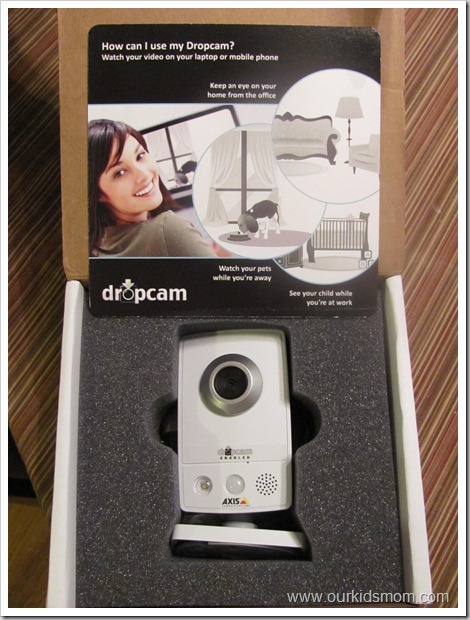 I learned that I can with the drop cam I can keep an eye on my home even when I am not there, I like the fact that I can go away and not have to worry about my home or my family’s things, and I want this wonderful drop cam for my dad to give him on fathers day. I like the versatility of the camera! gives you great piece of mind. I learned this would be great to put in a baby’s room and can be accessed form anywhere which is really nice. I learned it was reviewed by cnet! I like that the Dropcam live viewing and alerts are free! I like that the Dropcam could send videos to my smartphone. It would be very beneficial for me. I would like a Drop Cam. The Drop Cam Echo looks pretty cool it’s got sound and video. I didn’t see anything else on the site other than the drop cam and the drop cam echo. I have on child who is slightly destructive so this would be perfect for him. I’m getting tired of fixing windows and walls because he didn’t want to go to bed. I’m following you on GFC as Jenn Donnelly and on Twitter as @jdonnelly14 and I did retweet your contest. The drop cam is the coolest things. I could use it to watch my kids at home when they are with a babysitter. My first thought was how long does this take & how hard is it to set up. At there website I learned that it is a quick 2 minute setup. What a great feature-it can send you video straight to your iphone!! I like that it has the worlds’s easiest set up! i like drop cam on fb! I learned no technical skills are needed to use this. This would make a wonderful gift for my niece who is having twin boys! I love my three dogs like they are my kids too. I have so many times wondered what they do while I’m gone and also worry nonstop that something will happen to them while I’m gone and I won’t know. I would LOVE to be able to check on them from my phone while I’m gone. This is AWESOME!!! Like Dropcam on FB as well. Dugg on Digg as lewalk. I learned that it is compatible with Macs, which is a necessity for me. I can think of so many ways I could use this….fingers crossed! I follow via GFC! Thanks! I like you on Facebook. Chanelle L.
You can stream if live for free. Follower of OurKidsMom via Google Friend Connect – Terri. I learned that you can transmit your video to an Android phone. Entered OH Sew Lucky Designs giveaway. Entered giveaway for Bulldog Remote Car Starter. Entered giveaway for Hannah Mia. Entered giveaway for When Life Gives You OJ. Entered giveaway for Harry Potter DVDs. Entered giveaway for Thompson’s Water Seal. Entered giveaway for Field of Vision. Entered giveaway for Linksys E4200 Router. Entered giveaway for G Drive. Entered giveaway for Epson Artisan 835 Printer. I like the east 2 minute setup. I learned that the DropCam has a Horizontal Field of View of 47 degrees. I would love to have one of these viewing my front porch and entry door. The remote car starter. Thanks for the giveaway. I like this fact about DropCam: Your video is encrypted using bank-level security. It’s stored on remote servers on guarded premises.” would love to win it and try it out. We are expecting a grandchild next month & would love to have this so when he comes over we can check on him without going into the room & disturbing him since we both wear leg braces we can’t sneak in quietly. I think it’s awesome that I can access this camera from my phone…New baby coming soon to a home near me…very near…LIKE MINE. It would be great to be able to check in on my new baby boy and his mom from any where! 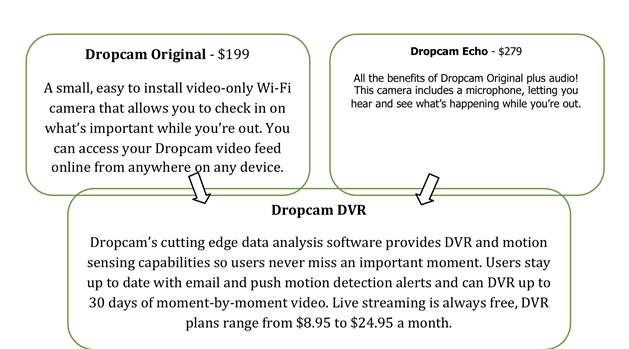 I loved watching the demos on Dropcam’s website, and one feature I really like is the optional DVR subscription to store recordings on a secure server, which would really give the user even more peace of mind. Thanks! I WOULD LIKE TO WIN THIS FOR MY HUSBAND. YOUR WEBSITE ROCKS!